Last week was the 241st anniversary of the US navy – ‘Tough.’, Bold.’, and ’Ready.’ declared the poster, though it omitted to say that the navy was originally set up to fight Britain in the early months of the War of Independence. 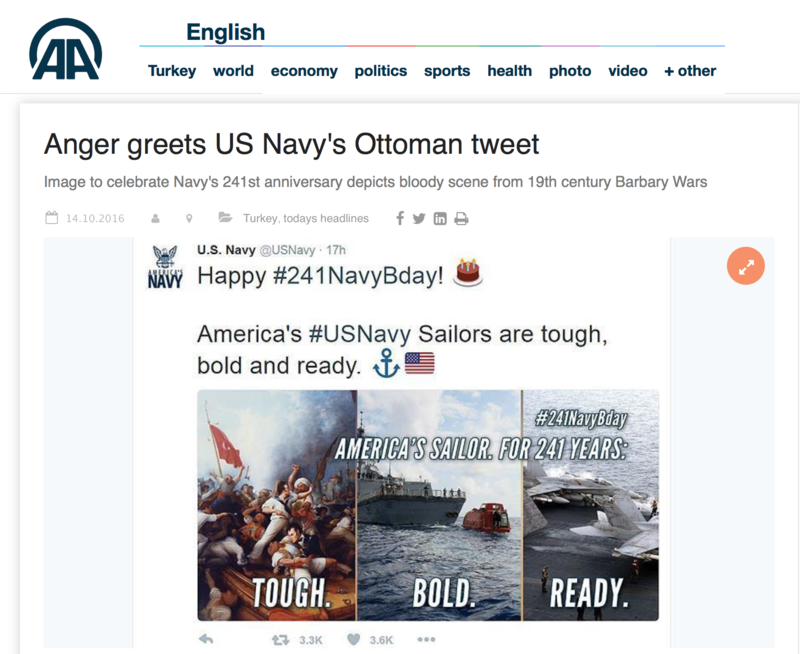 Instead in Turkey, eyes were suddenly glued to the poster as its first picture, labeled ‘tough’, showed a 19th-century picture of mayhem and gun smoke as American sailors, just distinguishable in white, fought with swarthy opponents. Above them fluttered, very recognizably, a Turkish flag. The offending picture is Stephen Decatur Boarding the Tripolitan Gunboat by the 19th-century Irish-American artist Dennis Malone Carter (Wikimedia Commons), and it is today in the National Museum of the US Navy. Carter’s flag is of course not the present-day flag of the Turkish Republic, but the very similar Ottoman flag that preceded it. Even at the time there was probably an anti-Turkish political subtext. Carter painted it in 1878 when a strong Philhellene element in the United States was supporting efforts to prise Crete out of the Ottoman Empire and the Russo-Turkish War of 1877–78 made this seem a plausible objective. Just possibly Carter was also inspired by the Marines’ Hymn, a stirring march written to music composed by the French composer Jacques Offenbach a decade earlier. This begins with a reference to ‘the Shores of Tripoli’ but all the known versions of this date from after 1900. On the other hand, by 1900 memories of the event to which the march refers were nearly a century old. The scene so flamboyantly depicted by Carter shows an incident which happened in August 1804 involving Stephen Decatur Jnr, son of one the earliest American naval warriors in the American Revolution and himself an American hero. The US navy was trying to prevent pirate raids being launched from North African ports against American vessels. This battle was Decatur’s second conflict in Tripoli that year. In October 1803 USS Philadelphia, an American naval vessel, had run aground on a reef and been captured by the Tripolitanians. So in the middle of the following February, Decatur and his companions stealthily seized the stricken ship and then set it ablaze to prevent it being used by its new owners. The battle that followed in the summer, led by another American naval hero, Commodore Edward Preble, lasted from July to September blockading Tripoli and eventually forcing a surrender. The high point was the raid by Decator in the first week of August. A report written in August 1804 in a letter by an American naval officer on board the USS Syren gives the flavour of the encounter. When our gun-boats got within twenty yards of the enemy, they discharged their great guns loaded with 40 lbs of mosquet-balls; this was followed with a volley of musketry which can drive obliged five of the gunboats, composing the enemies right wing, to cut their cables and retreat: our boats then bore up for those to leeward. Capt. Decatur boarded and carried the first boat…[his younger brother] Lieutenant James Decatur in the act of carrying the third was killed. Capt. Decatur continued down the line and carried the third; all of which were brought safely off. The attack continued one hour and a half; the Turks were driven out of Port Français, and must have suffered much from firing in the town as well as in their batteries. The reason the enemy’s fire did so little damage was on account of its being so badly directed. The next day [the Commodore] returned with a letter from the French Consul bearing strong marks of a pacific disposition; however the Commodore determined to attack them the next day to westward we will revenge our brave companions. This caused a small cessation of fire, but it was only momentary, and was renewed with redoubled vigour, and seemed to say, we will revenge our brave companions. At 5 o’clock o’clock. the call was made and the firing ceased by the 15th that Bashaw (i.e. 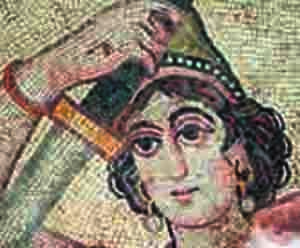 Pasha – not an Ottoman general at this date but the ruler of Tripoli) had proposed peace to us and the delivering of prisoners for $150,000; $100,0000 I believe has been offered. The Bashaw has declared he will suffer himself to be buried in the ruins of his castle or driven into the country rather than take less than $150,000. Therefore we are preparing for another attack on this day. It was in short a brutal and messy affair, with the Americans still under pressure at the end of the day to pay the Tripolitanian pirates a huge ransom. No wonder that some American conservatives today see the Barbary War as an early fight against terrorism. How much was Turkey involved? The answer is that the Pasha of Tripoli at the time acknowledged the suzerainty of the Sultan and paid an annual tribute (rather as the Americans did to him) but he was in practice an hereditary independent monarch. Edward Malone Carter painting his picture in 1878 probably had no conception of that, since by then Tripoli and Benghazi had been firmly reincorporated into the empire and flew the Ottoman flag. Nor, apparently did whoever made the unhappy decision to include Carter’s picture in the naval anniversary picture. Others of Carter’s pictures might have caused less offence since his paintings generally depict scenes in the American wars against the British during the 1770s and the War of 1812. US flags abound in the latter, but alas they are land not naval battles and would not have done for a naval anniversary poster. 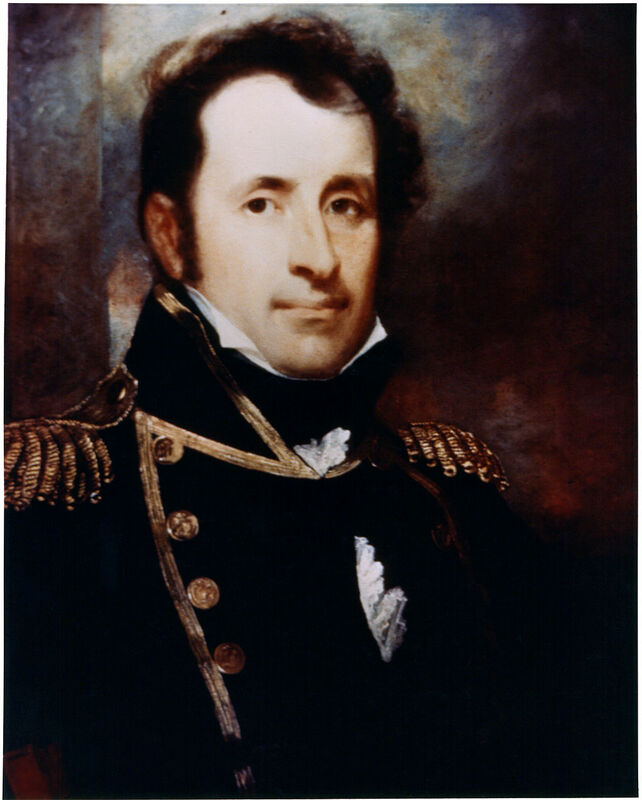 Stephen Decatur distinguished himself even more in the 1812 War, capturing HMS Macedonia from the Royal Navy in December that year. Stephen Decatur’s story ends on a peaceful note. After his early death fighting a duel in 1820, we find his widow, apparently by now a leading hostess in Washington which was still a fairly raw frontier town at least by European standards, becoming one of the closest American friends of the British Minister to the US, the famous Sir Stratford Canning. Evidently she knew how to forgive and forget. David Barchard is a regular contributor to Cornucopia. His new book 'Ottoman Lives' is due to be published in spring 2017.